A formal protest was lodged today with the Ethics Commission regarding their handling of tonight’s public process to consider recommendations from the Board Budget Analyst based on comparisons with the LA Ethics Commission. This letter, signed by six past Ethics Commissioners, an award-winning former Ethics enforcement officer, past head of SF Common Cause, past Board of Supervisors President, and community activists, outlines the specific objections and requests that the meeting be re-calendared for February. They would urge others interested in this issue to contact the Ethics Commission regarding the issues to be discussed at the meeting, the way it was scheduled, and the outreach to the political community. The Ethics Commission’s information is on its web site at www.sfethics.org with a copy of the Rose report and Ethics’ proposed topics. In addition to tonight’s meeting, Ethics has scheduled a meeting for the afternoon of December 10. Friends of Ethics is writing with objections and protests regarding the upcoming “Interested Persons” meetings scheduled for December 4 and 10, 2012. The notice was dated November 28, providing only three business days before the first meeting will take place. The Friends of Ethics bases its protest and objections on the following facts, and by this memo, formally requests that Ethics postpone these meetings until February. * The proposed Interested Persons meetings do not mention inclusion of a representative from the Board Budget Analyst office to present their report and to discuss its findings. Without their direct involvement, as well as the invited presence of Supervisor Campos who requested the Rose report, the Interested Persons meeting will have only the staff’s views of the report as a basis for discussion. We believe this fails to provide the direct interaction and communication that should be part of this process. 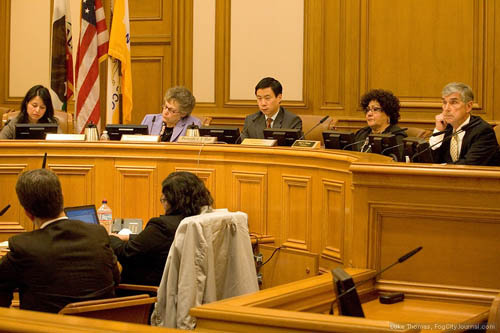 Ethics was requested by the Board of Supervisors to conduct robust and inclusive outreach to all participants in San Francisco’s political life. Ethics provided Friends of Ethics with the list used to contact Interested Persons about this meeting. We believe the list provided is not an adequate outreach, includes no community-based organizations active in electoral politics, any of the chartered Democratic clubs or other partisan political organizations, or special focus organizations active in San Francisco elections. We believe the lack of an inclusive outreach as evidenced by this list denies the Commission of a full discussion of the issues and is weighted toward the regulated community. We are puzzled by the fact that many people who do receive the Interested Persons notices are not on the list provided by Ethics, and seek a clarification on whether additional lists were used that were not disclosed to us. We also note that the late Joe Lynn, while the Campaign Finance Officer for Ethics, not only conducted extensive outreaches for IP meetings, including contacting past treasurers and press and posting notices on local political blogs and chat boards, but also later informed Director St. Croix in writing about those practices for the purpose of encouraging the continuation of such outreach. Ethics provided insufficient time for a review and analysis of recommendations that are significant and meaningful for the operation and success of the Ethics Commission mission. We believe that Ethics has done the bare minimum of notice of a public meeting and failed to take a serious approach to this important issue. Providing notice three days before the meeting, particularly in the holiday period between Thanksgiving and the first of December, means that no organization has an opportunity to place this issue on their agenda for a discussion or to endorse comments to be provided to the Ethics Commission. Ethics prepared an agenda that omitted significant and critically important comparisons between the Los Angeles and San Francisco Ethics Commissions that were included in the Rose report. While Ethics did list specific recommendations from the Rose report, the report itself detailed a number of additional differences that are significant to the San Francisco political community as we know it, and that should be part of a discussion of the Rose report. Los Angeles has a private right of action for citizens to act when Ethics does not; in Los Angeles this can include penalties under a civil action. San Francisco has no such provision. We believe this is essential to meaningfully empower citizens to directly seek compliance with our laws. Los Angeles requires disclosure of contributors of $100 or more to groups making “third party” expenditures. San Francisco does not require public disclosure of this money stream. Disclosure of donors to third party committees would add transparency, particularly if this has become a strategy to allow city contractors to influence elections. Los Angeles prohibits contributions from those seeking permits, while San Francisco does not. Friends of Ethics has determined that over 90 percent of all City Hall lobbying involves permit decisions. Los Angeles prohibits commissioners from fundraising for candidates, while San Francisco does not. This is the heart of pay-to-play politics that infects city appointments as commissioners are often the first stop for fundraising on behalf of city elected officials. We note a recent case where a city commissioner hosted a fundraiser that included contributions from city employees from the same department. The candidate returned the contributions, recognizing that commissioners are prohibited from seeking contributions from city employees. However, this demonstrates the potential abuse and underscores that Los Angeles’ policy is a stronger and more easily enforced prohibition. We recommend it. Los Angeles prohibits fundraising from city contractors and those seeking city actions. San Francisco allows contractors to fundraise and serve on candidate finance committees, although they may not contribute their own funds. Currently San Francisco also does not require candidates to disclose the names of their Finance Committee members. However, we strongly prefer closing the loophole, as Los Angeles has done, by prohibiting city contractors and permit seekers from fundraising. Los Angeles requires a more robust disclosure of “paid by” notification on telephone messages when 200 or more people are called. San Francisco sets the threshold at 500 people. Therefore, “paid by” calls to members of political clubs during the endorsement process would be missed under San Francisco’s standard but included under LA’s standard. Los Angeles provides a “Guide for Contributors” that educates donors and reduces confusion on such issues as aggregate contribution limits, prohibitions on officers of organizations receiving city funds, and so forth. This is done at minimal cost and made available on the Internet with no printing or mailing costs. San Francisco does not provide a Guide. Instead, the Ethics staff has recommended that the Commission rewrite the law to overturn specific prohibitions, stating that contributors are confused about the rules. The best approach is Los Angeles, where an educational outreach to contributors is part of their program. We note that San Francisco provides guides and outreach to most others involved in political activities, including committee treasurers, candidates and others but does not include an educational outreach to donors. Los Angeles prohibits political contributions from being made at City Hall or other city offices, including offices rented with city funds. San Francisco allows contributions to take place in the mayor’s own office, supervisor’s offices, at Redevelopment, Planning, Port or other offices – in short, anywhere that a donor chooses to make a contribution. We believe allowing contributions to be made in the workplace of city officials undermines public confidence and is inconsistent with other restrictions on the use of city resources for political purposes. Los Angeles has a more robust view of what constitutes lobbying and includes attorneys who offer strategic advice even if they do not directly contact a city official. San Francisco does not require registering or disclosing clients from such attorneys involved in orchestrating a favorable result for a paying client. Attorneys who serve as committee treasurers also do not face the same level of public disclosure as lobbyists. We believe this list of omitted topics, coupled with the unacceptable short timeframe provided for analysis and review by the political community, and the failure to provide adequate outreach, raises serious concerns that Ethics is not engaged in a serious effort to obtain the public’s views on its operations and policies based on the Harvey Rose report. We further note that Ethics has not provided a public schedule of when it will complete a summary of the Interested Persons meeting and comments, or a schedule for consideration by the full Commission of any recommendations. Our reasons for requesting a specific timetable for next steps is based on our observation of lengthy delays in staff action on issues even when raised by the Commission itself. We believe the political community will be unlikely to participate in a process that has no specific and public timetable for action but that could take more than a year to reappear. In July 2011, the Ethics Commission requested that staff draft proposals to close the loophole that allows committees seeking to draft a candidate to fall outside the normal reporting and disclosure requirements. However, staff did not produce a proposal until November 2012, 16 months later, and did so without an Interested Persons meeting to discuss their proposal. Also at the July 2011 meeting, the Ethics Commission requested that staff examine the loophole that prevented the Commission from acting in cases of Official Misconduct by a commissioner. Ethics staff still has not produced a proposal to close that loophole. Also in 2011, a Superior Court judge suggested that San Francisco adopt a policy prohibiting commissioners from recommending a specific lobbyist to parties seeking a contract or other decision from that commission. Ethics has not prepared any response to that suggestion. In June 2012, Rules Committee Chair Jane Kim requested that the Ethics Commission provide some information on the city’s Ethics laws in languages other than English, noting that the rules are as important to donors and committees as they are to the public. The Ethics Commission has taken no steps, including in the election just concluded. Given this record, we believe that any public process to examine the Harvey Rose Report and build new recommendations must include proposed timelines for action if there is to be public confidence that this process is meaningful. We also strongly recommend that the Ethics Commission set aside time to allow a full discussion before the Commission itself. We believe that such a discussion should not place a two-minute limit on public members making comments. For the above reasons and cited facts, Friends of Ethics requests that the Interested Persons meeting on the Harvey Rose Report be postponed until February when the political community will have an opportunity to evaluate the proposals and endorse changes, that the Commission immediately engage in a more robust outreach effort that extends beyond the list provided by Ethics to us, that the conversation be broadened to include all topics of comparison between Los Angeles and San Francisco, and that a proposed timeline for a record of the Interested Persons meeting and action by the Commission be provided. We submit this protest respectfully and with support for the work of the Commission and specifically for the thorough review of any steps that can improve the Commission and public confidence in our political process.